The rechargeable, splash-water protected working lamp with emergency light function from the AccuLux series model JobLux LED Focus has a casing made of robust, shock-proof plastic. The lens optic of the power LED generates a strongly focussed light beam with a high range. A replacement of the LED lamp is not required. With the 17 h main lamp operation, it is one of the leaders in this sector. The JobLux Power LED Focus has a 120° flexible lamp head. It is possible to change between power LED and the LED pilot lamp. The rechargeable, maintenance-free led gel battery can be charged on 230 V AC through the integrated charger and has an overload and deep discharge protection. The charge state of the lamp is displayed through the integrated red LEDs. 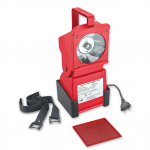 The wall holder, a practical belt and a red viewing pane are included in the delivery.